A judge decides that a jury needs to examine the circumstances of Lisa McPherson's death. The Church of Scientology is given time to appeal the judge's ruling that the lawyer for the McPherson estate should not be disqualified. The church says a survey shows that Pinellas jurors have been heavily influenced by media reports. Respondents used words such as "cult" and "evil" frequently. Attorneys for the Church of Scientology in Clearwater withdrew their request Tuesday 10 June, to transfer a civil case to Palm Beach or Broward county. Scientologists will allow the upcoming trial to "determine the ability to empanel and unbiased jury." Lawyers for the Church of Scientology again say that media reports have turned Tampa Bay against them. A lawyer involved in a wrongful death suit should pay more than $2-million, the church contends. After just three hours of deliberation, the jury returned with a verdict of $4500 in damages. See the announcement on the message board. Also read my Letter to the Editors, correcting an error they copied from the Associated Press article. And more information on the latest jury verdict. Jurors don't buy the church's argument that a lawyer involved in a wrongful death case owes it more than $2-million. The following articles are in response to new Scientology release forms which found their way to the Internet. Scientology has apparently not learned its lesson that locking up psychotic people like Lisa McPherson and depriving them of medical attention was not a good thing to do, but instead wants its members to sign a - what's been termed - "The Lisa McPherson Clause"- if they want to do there Scientology "services" in Clearwater, the same town they held Lisa until she was dead. Members have to sign the contract, promising not to sue if they are harmed. 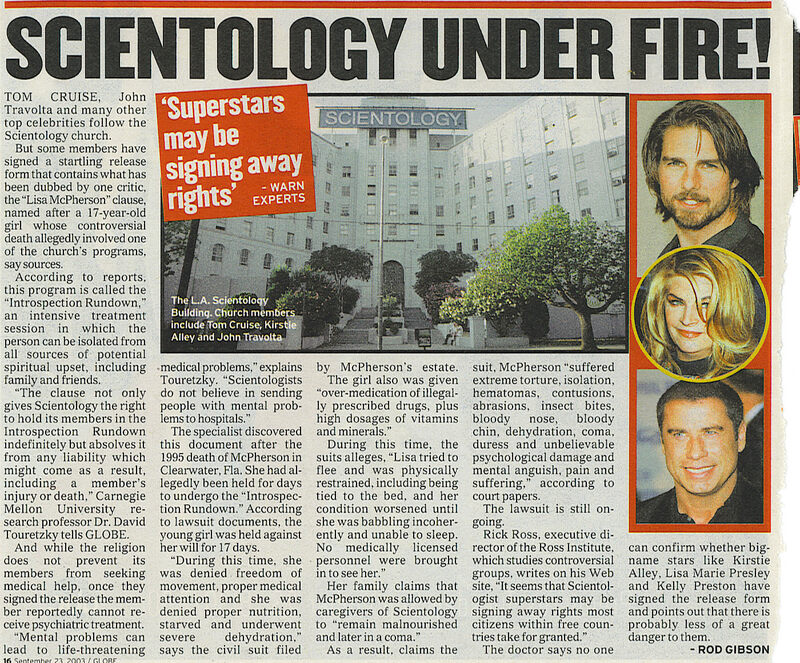 Will Scientology Celebs Sign 'Spiritual' Contract? Imagine a church so dangerous, you must sign a release form before you can receive its "spiritual assistance." KDGE-FM (Dallas) morning show, December 4, 2003: interview with Peter Alexander. Transcript courtesy of Sue Mullaney. Terms of the unexpected settlement are confidential in the wrongful death suit brought by the estate of Lisa McPherson. To the disappointment of some outsiders, those mired in the Scientology case were ready for the draining episode to end. The settlement of the Lisa McPherson wrongful-death lawsuit against the Church of Scientology leaves many questions about the case open to speculation.